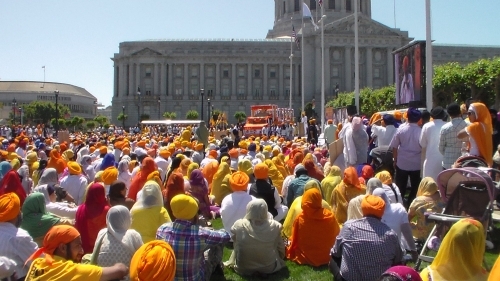 Why wasn't SikhNet or anyone from Yogi Bhajan's Tantric yoga group participating in Sunday's Sikh Nation Freedom March & Remembering 1984 at San Francisco Civic Center yesterday? It seems Yogi Bhajan's sect is big on inter religious gatherings with Hindus while performing "magical" pujas but what about SikhNet's participation in intra religious gatherings with fellow Sikhs? "Merge in the Maha Shakti. This is enough to take away your misfortune. This will carve out of you a woman. Woman needs her own Shakti, not anybody else will do it. When a woman chants the Kundalini Bhakti mantra, God clears the way. This is not a religion, it is a reality." In addition to portraying our deep spirituality, we believe that the graphic simplicity and symbolic correctness combine to make this logo powerful and relevant. Our hope is that this image will attract, inspire and encourage expansion of our organization and all that we do."